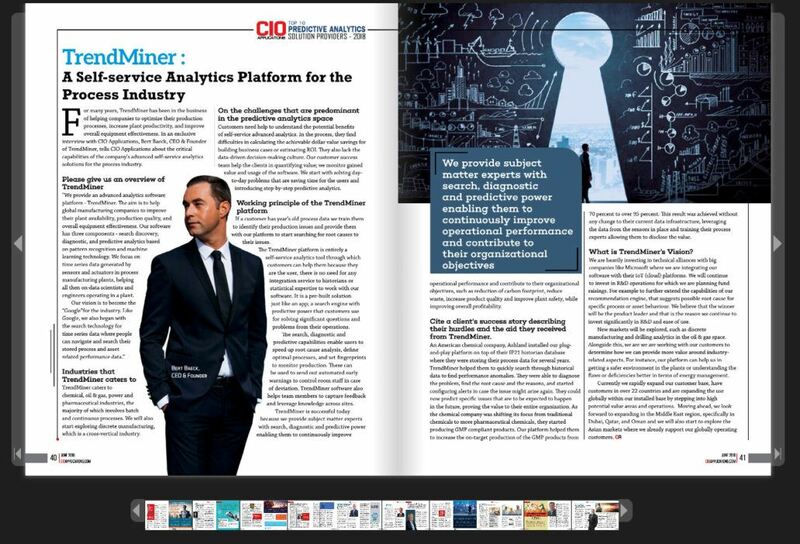 Earlier this year a distinguished selection panel comprised of CEOs, CIOs, VCs, industry analysts, and the editorial board of CIO Applications narrowed the final 10 providers of the most valuable predictive analytics solutions available, and among those 10 was TrendMiner! Organizations fully embracing predictive analytics are able to continuously improve operational performances and contribute to their organizational objectives, such as reduction of carbon footprint and waste, increasing product quality, and improving plant safety – all while improving overall profitability. TrendMiner is committed to delivering the innovative software that helps the people in our industry succeed in their journey towards digital transformation. Click to read the interview with CEO & Founder Bert Baeck. Watch how Marc Pijpers of Sitech uses predictive industrial analytics to contextualize asset performance with process data and improve profitability. Learn how Total used TrendMiner to predict future process evolution, the benefits this delivered, and why they expanded their use of TrendMiner across the entire Refining & Chemicals division. Read more about how self-service predictive analytics can reduce downtime & help you avoid unnecessary risks in a recent article featured in Processing Magazine. CIO Applications magazine stands out with its unique approach of learning, as industry leaders offer professionals the most comprehensive collection of technology trends. They are determined to propose a myriad of additional services that can improve businesses and help customers deal with issues related to this industry. CIO Applications congregates insights from industry experts to develop a knowledge network that helps businesses step ahead and guides them towards adopting the best-in-technology, to assist in providing seamless and convenient solutions for an enhanced customer experience. Key to CIO Applications’​ success is its mission to contribute towards filling the growing gap where decision makers are uncertain of which technologies are best suited to develop their organization. The magazine’s professional team of in-house writers is able to scale articles to a new level of perfection.